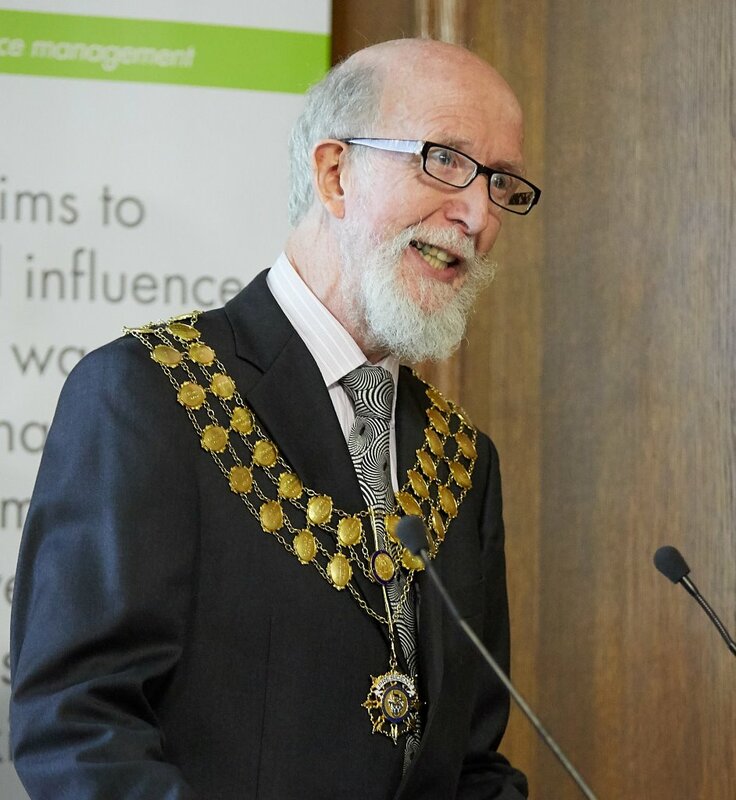 At his inauguration on 17th October 2017, Professor David C. Wilson launched his CIWM Presidential Report: Making Waste Work: A Toolkit – Community Waste Management in Low and Middle Income Countries. The aim is to help poor communities in the least developed countries, part of the 40% of the World’s population who lack access to any solid waste management services, to help themselves by developing self-sustaining businesses making useful products for the local market from the resource value in their waste. WasteAid UK have prepared this practical guidance on low cost recycling technologies, involving minimal capital investment, to help people become self-employed recycling entrepreneurs, providing a very valuable service for the health and well-being of their community, and the whole planet – as well as reducing poverty and creating sustainable livelihoods. In his inauguration speech, DCW called on the international community to increase substantially, from the current 0/3% to 3.0%, the proportion of Official Development Assistance directed to solving the ‘global waste emergency’. But he also said that it was not enough to work with national and local governments to solve the problem from the ‘top down’. In parallel, it is necessary to work from the ‘bottom up’, helping communities in the poorest countries, where the local authority often has no funds to provide a service, to tackle the problem themselves through the resource value in the wastes. If, for example, food wastes or plastics are kept separate, they can be turned into new, useful products. One of the gaps identified by UNEP’s Global Waste Management Outlook ( GWMO – for which DCW was the lead author) was for practical guidance on low-cost ‘waste to wealth’ technologies which involve minimal capital investment and make products to sell in a local market. 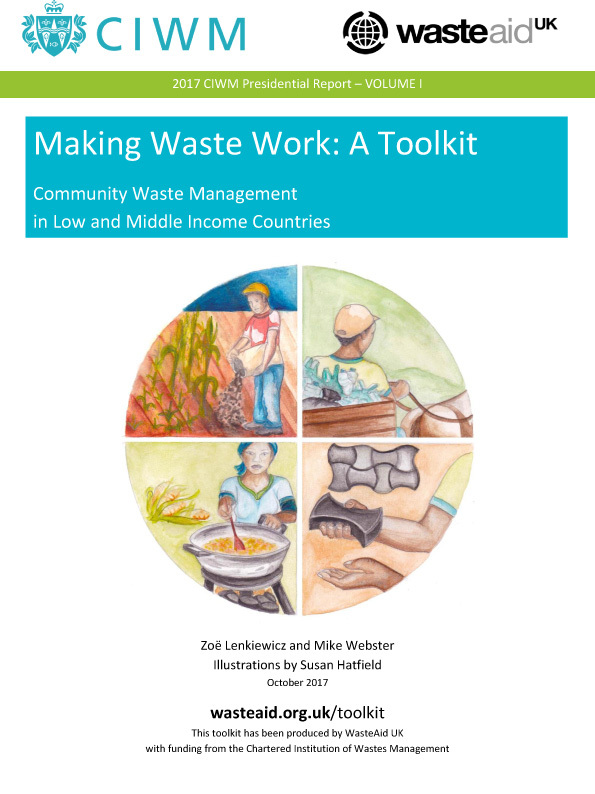 Making Waste Work: A Toolkit has been developed by WasteAid UK to fill that gap, providing accessible and well-illustrated guidance designed for use by local practitioners. An early draft of the report was field tested at a pan-African workshop in The Gambia. 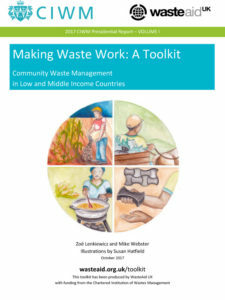 Volume 1 covers part A, Be informed: Community waste management essentials, and part B, Be prepared: How do I make a waste project happen? Volume 2 covers part C, Be inspired: Step-by-step guides, which include measuring what is in your waste, five technologies for recovering value from organic wastes, four focusing on plastic wastes, plus waste collection and safe disposal of the residual wastes. There is also a short Executive Summary. The links above are to the three reports on the CIWM website; the dedicated WasteAid Toolkit homepage gives access to all the material, including the individual How-to guides, in separate user friendly formats designed for mobile devices and for laptops/ desktops.